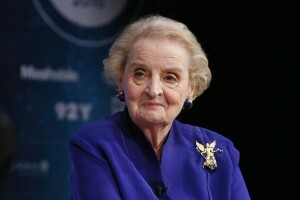 With her family, Albright fled her native Czechoslovakia after the Nazi occupation (she learned late in life that her family was Jewish) and earned degrees from Wellesley College and Columbia University (M.A. and Ph.D). President Bill Clinton appointed her ambassador to the United Nations in 1993, then secretary of state in 1997.